Properties in Rio de Janeiro St. Francis Xavier Station average 4.6 out of 5 stars. DUPLEX IPANEMA PENTHOUSE POSTO 9. Jacuzzi, 2 Terraces + Wow Cristo Views! Property 6: DUPLEX IPANEMA PENTHOUSE POSTO 9. Jacuzzi, 2 Terraces + Wow Cristo Views! DAILY PROMOTION 250 !! BEAUTIFUL FLAT VARANDA, KITCHEN, STOVE, APART HOTEL 10! Property 14: DAILY PROMOTION 250 !! BEAUTIFUL FLAT VARANDA, KITCHEN, STOVE, APART HOTEL 10! Large Lux Apt Ipanema Beach NEW LOW RATES! Property 22: Large Lux Apt Ipanema Beach NEW LOW RATES! ENJOY EASTER'S EVE AT THE HEART OF LEBLON! Property 28: ENJOY EASTER'S EVE AT THE HEART OF LEBLON! 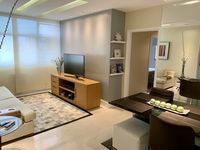 Artist two bedroom apartment very near the metro, in the heart of Copacabana!! Property 35: Artist two bedroom apartment very near the metro, in the heart of Copacabana!! Spacious 2BR in Rio's most upscale neighborhood! Best value in Luxurious Leblon! Property 38: Spacious 2BR in Rio's most upscale neighborhood! Best value in Luxurious Leblon! Copacabana beach block in the most popular street with lots of comfort! Property 39: Copacabana beach block in the most popular street with lots of comfort! Comfortable and silent 1 bedroom vacation apartment with balcony in apart-hotel in Copacabana! 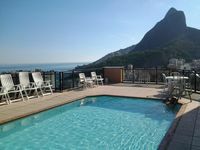 Property 44: Comfortable and silent 1 bedroom vacation apartment with balcony in apart-hotel in Copacabana! Family friendly, large, natural light, charming, cozy. Copacabana of the 50's. Property 45: Family friendly, large, natural light, charming, cozy. Copacabana of the 50's. The apartment was nice and clean, everything worked. The wifi was excellent. The owners are super attentive, great stay.